Congrats! 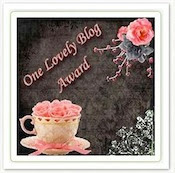 I've given you the One Lovely Blog award. Stop by to check out all the details. Happy to hear you're up to 9 followers! Do you still need to know how to attach the award to your blog? If so, leave a comment on my blog and I'll make a quickie instructional video for you and post it in the next few days.